For many years, the pace of change in mass market IT has dwarfed that of broadcast technology. For example, consumer cameraphone resolution has increased over the last ten years by 30,000%. In comparison, broadcast resolution hasn't changed significantly. The development costs of consumer cameras are amortised over 1,000,000,000 units - there is no way the broadcast industry can compete on the pace of progress. The needs for cameras from consumers and broadcast are not aligned, so production cannot benefit directly from this mass market. But in post production, large parts of the IT infrastructure are exactly those which benefit from the latest revolution in mass market IT. Computer processing power, storage and internet access, all fuelled by mass market consumer demand, are exactly the features offered by the cloud. As new technology enables more and more of the broadcast workflow to move into the cloud, little more than a modest computer and an Internet connection is needed to be able to create in the cloud. Processor speed, file size, and security are no longer issues. Now, instead of transitioning to newer and newer generations of broadcast hardware, were moving from one IT solution to another. What Makes the Cloud Suited for Post-Production? Just as electricity is provided more economically by large-scale suppliers, processing and storage requirements can often be met more economically by cloud services. And just as electricity comes to us directly via connection to a power grid, data comes directly to a computer via connection to the Internet. In addition, cloud services from different providers interact through automated interfaces, providing a highly flexible way of using different suppliers throughout the workflow. However, when it comes to video post-production, not just any cloud service will do. Generic cloud-computing providers, such as Amazon Web Services, are built for IT and consumer data rather than the voluminous data and performance requirements associated with broadcast video. The requirements for editing video are onerous, with large amounts of data needing real-time response. Rendering effects and transitions in a generic cloud environment are expensive, and the unresponsiveness would be frustrating for users accustomed to desktop solutions. Building a broadcast post-production operation on a generic cloud infrastructure is expensive and doesn't meet broadcast reliability requirements. Dedicated platforms optimised for broadcast applications not only offer lower cost and responsive performance, but also control of where data is stored for legal and regulatory reasons. A cloud service lives or dies by its service quality. Over time, competition will fix reliability. The capacity of the Internet and cloud services is essentially unlimited, with supply expanding to meet demand. Storage and Internet speed nearly double every year, and new solutions from the world of mobile are improving power consumption within the cloud. I have always found that the greatest efficiencies come from using client computers to undertake as much of the workload as possible. Though it might sound odd for a cloud solution, such a scenario provides immediate scalability, reduces latency to negligible levels, and significantly cuts costs. In fact, combining client processing with a dedicated cloud model allows us to give our FORscene clients unrivalled value for money. The cloud is currently well-suited to the post-production tradition of working with proxies, a method that for the foreseeable future will be more efficient than working with high-resolution sources. These proxies will continue to improve in quality and resolution, with, for example, higher resolutions for fine-cut editing than for logging. I already make home videos in 4K in the cloud. Over time, connection speed has doubled every year, and storage costs have halved. As these factors continue to improve, the cloud will look more and more attractive as an alternative in a wide range of post-production workflows. FORscene has supported SD proxies for six years (though productions tend to use lower resolution to save cost). Conforming from original HD sources ensures minimal generation loss on the final output. A decade ago, technical limitations such as computer speed, bandwidth, and storage constrained viable cloud-based post-production functionality. Since then, computers have become 20 times faster, Internet connections 1,000 times faster, and disk storage 1,000 times larger, thereby eliminating technical constraints on features and functionality. Technology has made it easy to do post-production in the cloud. Now the focus is on improving and perfecting reliability, responsiveness, interface design, price, and integration. Data security is an issue with any IT-based system. The risks of losing data can be mitigated by keeping multiple copies of data in multiple sites something that is much easier for a cloud provider to do well than for an individual broadcaster. Workflow changes take people out of their comfort zones and therefore happen much more slowly than changes to the underlying technology. When FORscene launched a decade ago, people were understandably cautious. However, now people use the cloud in their everyday lives, they are more open to adopting it professionally. An increasingly technology-literate young workforce already fluent with cloud technologies in their personal lives will accelerate cloud acceptance and adoption. The future of cloud-based broadcast infrastructures goes well beyond editing. Maintaining different silos of equipment for different stages of post-production becomes less important as the cloud offer extends. Already, the cloud offers ingest, graphics creation, post-production, publishing, hosting, search, distribution, and advertising. Producers of genres such as near-live sports for Internet and mobile distribution can already do all their post-production in the cloud. 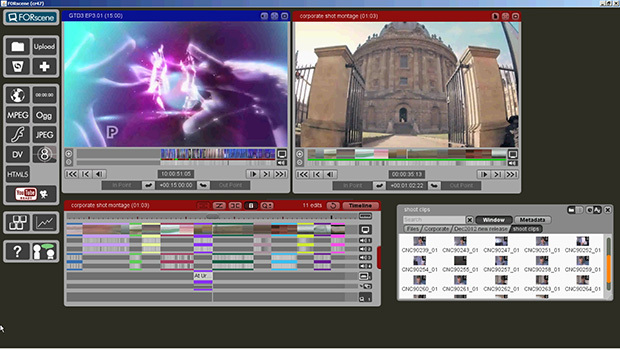 Dedicated cloud post-production platforms such as FORscene can take in multiple live HD video feeds (at one point during testing for the Summer Games, there were 200! ), incorporate graphics from various cloud creation systems, perform all the editing and finishing, conform at full resolution, and hand over to another cloud solution for volume distribution. Clients can (and do) mix and match. In fact, Microsoft Azure is designed for just such a scenario. The relentless advances in technology are transforming post-production. Traditional desktop IT solutions are being replaced with more cost-efficient and productive cloud-based solutions. This technology change is transforming the distribution and consumption end of the business as well. Suppliers of traditional post tools would do well to embrace the unending power of the cloud.